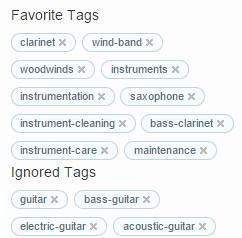 Primarily a Wind Band musician. Clarinettist/Bass Clarinettist, making occasional attempts on a Tenor Sax when times are hard. 11 Do we ask popular questions on this site that already have adequate answers on the web? 30 Testing for exceptions with [TestCase] attribute in NUnit 3? 15 Are Tetra Pak tomatoes more sustainable than tinned?